I bought this blow-up pool for the kids the other day and it might possibly be the best money I've spent all summer. They absolutely love it and they each have a bright pink sunburn to prove they've spent hours outside this week. I feel bad about their sunburns. Really bad. I re-applied sunscreen multiple times. We just live close to the sun! It's been warm here lately. I'm tempted to say it's been hot, but the high 80s probably sound heavenly to all of my southern friends so I'll stick with "warm". It's really only "warm" in the afternoons though. Most mornings and evenings I still need my Slanket (quite possibly the best money that John spent last winter) when I sit outside. I love Colorado! I also love the color orange. And I really, really love my Slanket! Oh. 80s! That sounds heavenly. When we visited CO a few years ago I got a couple of nasty sunburns. You're right about being close to the sun! Those are such great pics of your three kiddos. Very cute! I bought a pool just like that last year & Ethan loved it! I let Justin talk me out of it this year w/Drew being so small....a huge regret! LOVE your back yard! I remember how it looked before & this is AWESOME! Are the rocks all the way around? I remember when I would be at camp in CO that I would re-apply sunscreen on me & the kids...and yes a little sun burn was there. After I did that over and over again the sun burns would eventually turn into a nice tan. I also loved that you didn't wake up warm at all, where you had to have layers. I also love the summers there with NO or little humidity...Iowa is just killing me!!! I love summer. But I think I would love Colorado summers even more!!! We've had two of those pools and they really are the best of their kind. We adored them. Now, with a dog that chews, not gonna happen. And you are making me miss my mother. All that talk about CO weather. Ha! The #1 reason I want to live in Colorado: the weather! Your slanket cracks me up every time you mention it! That pool looks like fun! We're high 80s too. I call it HOT. If I'm sweating, it's hot. And I'm the one with the sunburn this week. My kids just tan while I just keep burning. Yep... Your Southern friends might call 80's warm. Enjoying Mt.View this week. Toasty but cooler ams and pms. 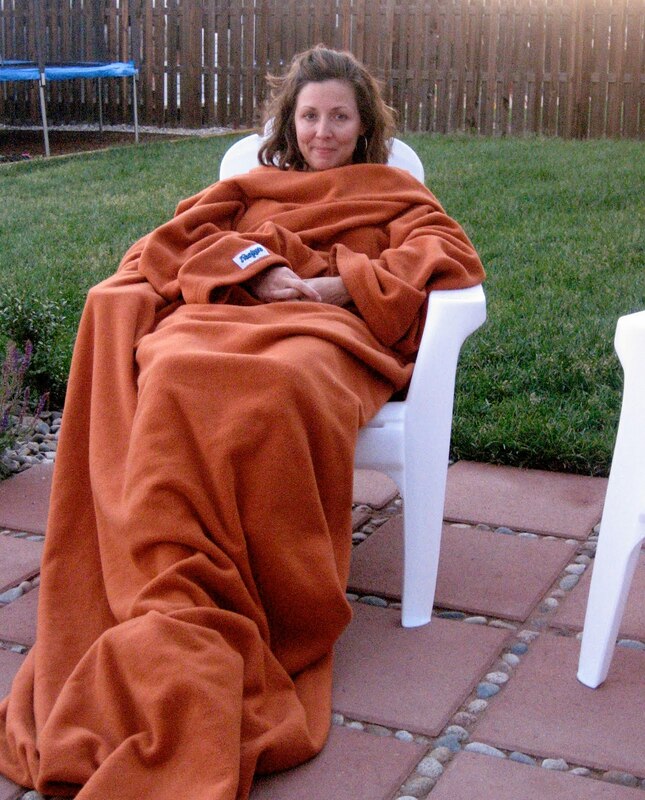 It would have to be pretty chilly for me to need a slanket. My choice of colors: Purple or Hot pink though orange looks great on you, Mer. We have that exact same pool and my kids spend hours in it. Glad your kiddos love it, too! We are dreaming of the days where temps are in the 80s. Can't wait for fall. I think we're going to get one of those next summer...looks so cool and fun! i'd like to take a dip in that pool. 80's sound heavenly. it was 100 here today and i let my neighbor gal convince me to go walking at 4:30. what was i thinking?